Boat Slip - Pomme De Terre Lake! Pomme de Terre Lake, located in the Osage Lakes Region, is a beautiful, clear lake with 113 miles of shoreline and over 7800 surface acres of water. Named the "Gem of the Ozarks", it is well known for its bass and muskie fishing and is ideal for camping, canoeing, hiking and water sports. Rural and peaceful in atmosphere with friendly people, it makes a great place to raise your family or plan your retirement. 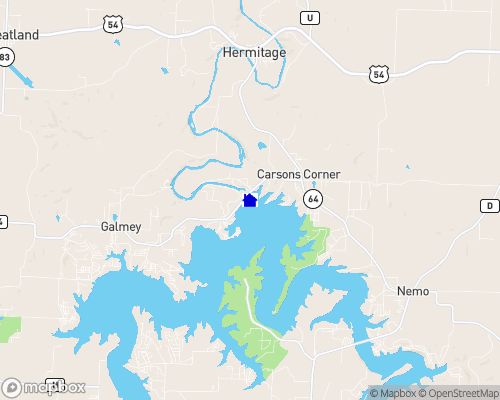 Located just 50 miles from the Springfield, MO metropolitan area and 45 minutes from Lake of the Ozarks, Truman and Stockton Lakes, you can have the best of both worlds at Pomme de Terre Lake. Fishing: almost all year round! Fish from the shore, bring your boat, or rent a fishing boat while you're here. Fresh bait and tackle is available anytime, as are local fishing maps. Or better yet, hire a guide to show you the way! Attend Muskie Guide For a Day and find out how and where to fish Muskie. (You can call Muskie, Inc. at 417-282-5628 for more information). Muskie Fishing in Missouri: Pomme de Terre Lake was selected as a site for muskie stockings because of its size, clear water and excellent habitat (aquatic vegetation and flooded timber). It also has an abundant population of large prey fish for muskie to feed on. Muskellunge, or muskie, is a member of the tiger muskie. Northern pike and tiger muskie introduction have been discontinued. The pure-strain muskie can be identified by its dark black vertical bars and elongated spots on a green to yellow-green background. Boating on the Lake: Enjoy the thrill of personal watercraft, tubes and the infamous ski bob on the beautiful waters of spacious Pomme de Terre lake. Water skiers enjoy the smooth lake surface, without the crowds you see at most of the larger lakes. Or just take a leisurely cruise to view the natural beauty of the shoreline. You're sure to enjoy. Camping: from late spring through early autumn camping is available at several Corps of Engineers Parks and two locations of Pomme de Terre State Parks, as well as several full-service privately owned campgrounds and RV parks. Golf at The Pomme de Terre Golf & Country Club: You can enjoy your game at the Pomme de Terre Golf & Country Club located in the Wheatland area. With bent grass greens and dog leg fairways, you'll have a great time while trying to improve your game. It is open all year and is accessible from either HWY 254 or HWY 83. Men's Golf Day is every Monday; Women's Gold Day is every Thursday.